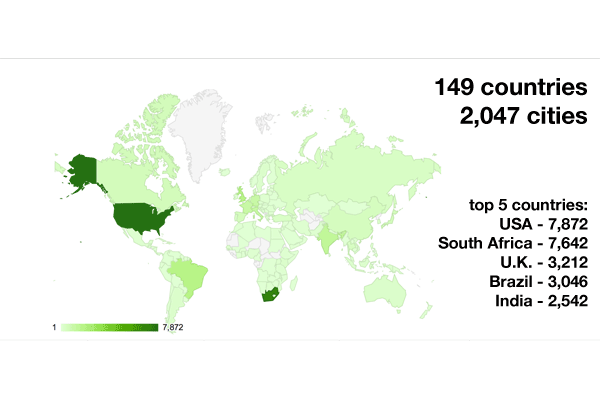 KRISP Report: Bioafrica.net & SATuRN webpages received 186,746 visits in the past 12 months! The bioafrica.net is Dr. Tulio de Oliveira research group website at the Wellcome Trust Africa Centre for Health and Population Studies, University of KwaZulu-Natal. The bioafrica.net website is online for 12 years and it is one of the most popular bioinformatics and drug resistance websites in Africa. In the past 12 months, it has received visits from 149 countries and 2,047 cities (Source Google analytics) with a total of 186,746 pages visited. The website has also been linked from 1,024 websites and has been mentioned in many scientific journals, including Science and Nature. A significant number of visitors access our website in order to use online bioinformatics tools and databases that are hosted in our Linux server at the South African Medical Research Council. Popular tools and databases of our website include HIV, HBV, HCV, HPV and HTLV-1 subtyping tools, the mirror of Stanford HIVDB and SATuRN RegaDB. Another feature of our website is that distributes all of our publications as full text and open access PDF documents. At present, we are producing PowerPoint presentations and short digital videos that summarize the results of our publications. Again, we would like to thank our visitors and sponsors for allowing our website to become an important source of information in Africa. Please keep visiting it so we can keep developing it!